Speak with any student who has taken a course taught by Wilfrid Laurier University Associate Professor Bruce McKay, and they will likely describe the experience as engaging, fun and informative. Since joining Laurier in 2008, McKay’s innovative teaching, including an in-class rap-music project and costume parties, have become known among the student body. A cellular and behavioural neuroscientist who researches recreational psychoactive drug use, McKay has been honoured with three teaching awards since he joined the Department of Psychology. The Wilfrid Laurier University Students’ Union presented him with a teaching excellence award in 2011, and he was honoured with an Award for Teaching Excellence from Laurier in 2015. McKay’s teaching philosophy incorporates a healthy mix of education and entertainment — “edutainment,” he says. “Students want to enjoy learning and, from a neuroscience perspective, if they’re more emotionally invested in something it will increase their rate of learning — that’s something we know translates from rats and monkeys to humans,” he says. Apart from the topics being covered, McKay’s classes have grown in popularity for two standout extracurricular activities. The first is an opportunity for students to earn bonus marks for writing an original rap. Each year, 10-12 groups participate. McKay’s colleagues were slightly sceptical of the activity, but were quickly won over when they saw the creative effort being applied. McKay also holds bi-annual neuroscience costume parties in the fall and winter semesters. In both activities, current students, former students and graduate students help McKay to determine the allocation of bonus points. Since his childhood, McKay knew he would work in science — but he always thought it would be in medicine. His fascination with the brain took hold in his final year of high school, leading him to study neuroscience in university. But after volunteering in a hospital, he realized he had no interest in practising medicine. It was during his fourth year of university that McKay started to research how drugs affect the brain and behaviour, leading him to pursue master’s and doctoral degrees in neuroscience at the University of Calgary’s Hotchkiss Brain Institute and a post-doctoral fellowship at the Baylor College of Medicine. Laurier’s balance between research and teaching attracted him, and he joined the university as a faculty member. “I had taught as a teaching assistant in undergrad and really missed that experience during my graduate studies,” he says. Outside the class, McKay is committed to being approachable and accessible to students. In 2015, he was appointed associate dean: Student Services in the Faculty of Science — a role that he says has been the most rewarding part of his career at Laurier. 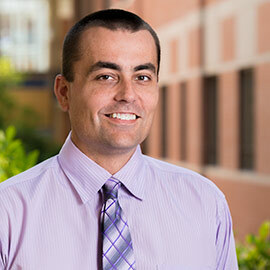 Since joining Laurier, McKay has also worked with Centre for Teaching Innovation and Excellence (CTIE) on numerous initiatives, such as introducing online proctoring software that verifies the identity of students and monitors and limits their online behaviour during designated online test time. The approach has also helped students who have test anxiety succeed on their final exams. In adding to reducing anxiety, holding the final exams online speeds up the marking process. And, McKay can save up to 12,000 sheets of paper each year by using online testing for in-class courses. McKay is among many outstanding educators at Laurier who are recognized for their contributions. On Feb. 2, 2017, Laurier will honour the 2016 teaching award recipients and others who have made significant contributions to the educational experience of Laurier students. Learn more about nominating someone for the Wilfrid Laurier University Award for Teaching Excellence before submissions are due on Jan. 15.